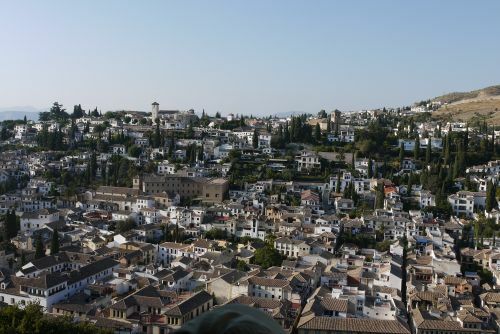 Our next stop on our Andalucía tour bus was Granada. 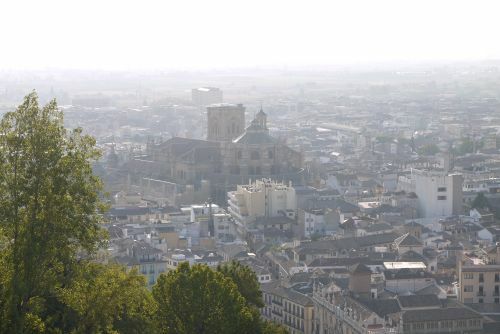 Granada is a smallish city in modern day terms with only about a quarter million residents. Today the city is best know for two things, its status as one of the preeminent University cities in all of Spain and the Alhambra. 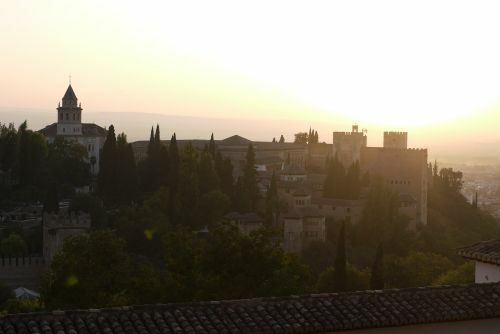 The University of Granada, one of the most prestigious universities in all of Spain, is home to about 80,000 university students. With one in four residents a student of some sort, the city is a buzz day and night. And like any college town, there are an abundance of cheap eats, a nice plus for any budget conscious traveler. One of our favorite local establishments was El Piano (http://www.el-piano.com/). A vegan restaurant, this little gem had the most amazing array of hot and cold salads and vegetable mixes. Our favorite dish was a surprisingly tasty carrot salad with raisons. With a total bill of around 10 euros for two people you can’t beat great food at a great value. We even had the pleasure of enjoying some private entertainment as a local college student was trying to impress his date by playing a few songs on the piano located in the restaurant. 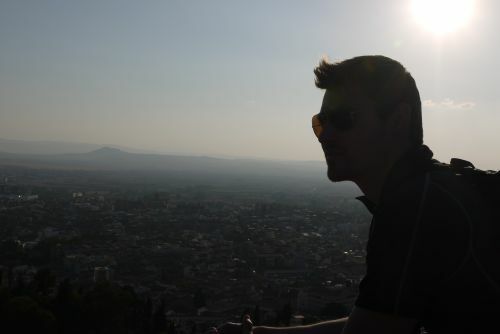 The Alhambra is the most visited tourist attraction in all of Spain. A monumental complex in size and importance, the Alhambra is comprised of several structures each with their own unique story and history. The site itself dates back to the Moorish Nasrid Dynasty in the 12th Century when this “palace city” was used as royal residence and fortress. 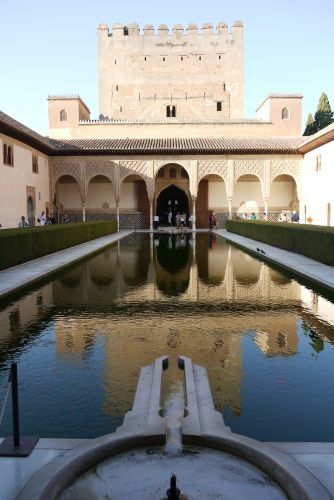 After the Reconquista and surrender of the Nasrid controlled Granada to Isabella and Ferdinand, the Castilian Crown assumed control of the Alhambra making it their official royal residence and center of Spanish political life. 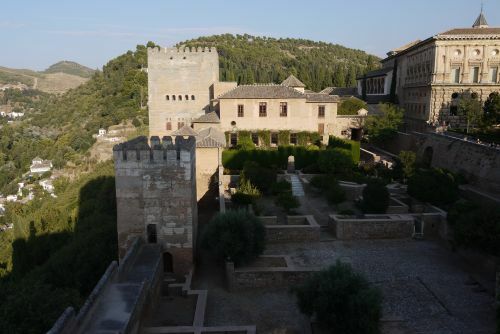 Of all the separate structures the three most notable and memorable to us were the ancient fortress of Alcazaba, the Nasrid Palace, and the Generalife gardens. 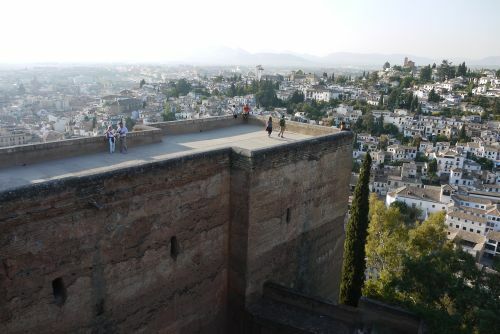 The Alcazaba, the oldest of all the structures in the Alhambra, was originally used as the city fortress during Moorish rule. Situated furthest from the modern day entrance which is at the center of the larger complex, it’s a full 20 min. 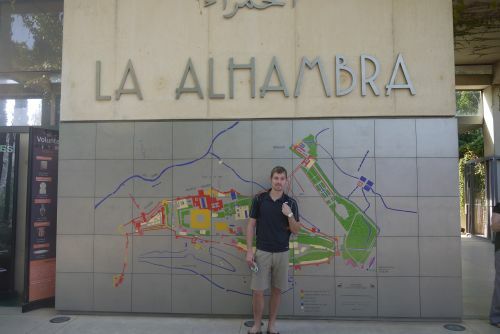 walk to the Alcazaba – just to give you an idea how large the entire Alhambra is. 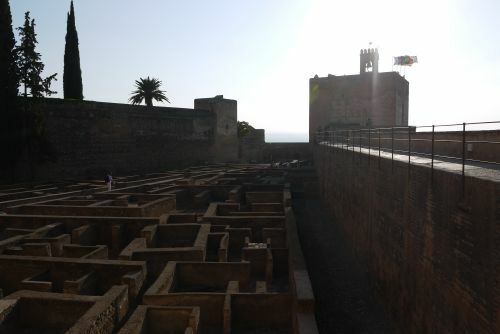 Similar to a medieval castle, it’s hard to picture what the Alcazaba was like during its heyday. From the fortress walls to its many ramparts, the Alcazaba certainly offers some of the best views and cityscapes the Alhambra has to offer. 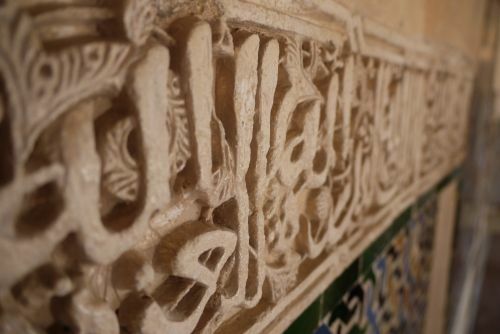 Next on our Alhambra visit was the Nasrid Palace. 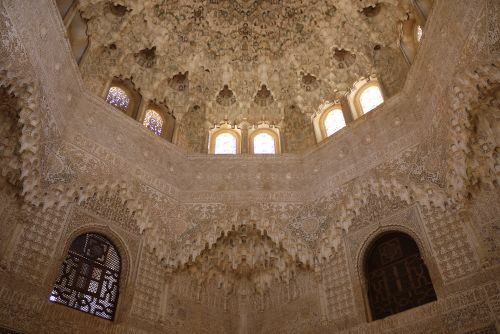 The Palace is the crown jewel of the Alhambra and worth the price of admission in an off itself. 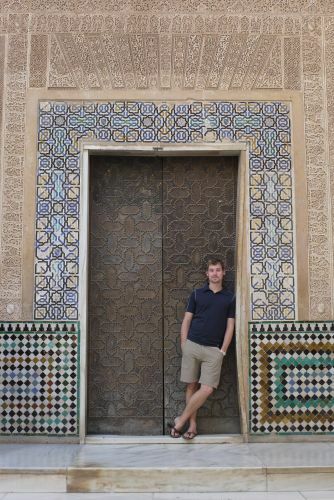 Given the level of interest and tourist traffic, upon entry to the Alhambra you are given a specific time slot in which you are allowed to visit the Palace. Lucky for us, we somehow ended up at the front of the line, which offered us a fairly unpopulated stroll through. 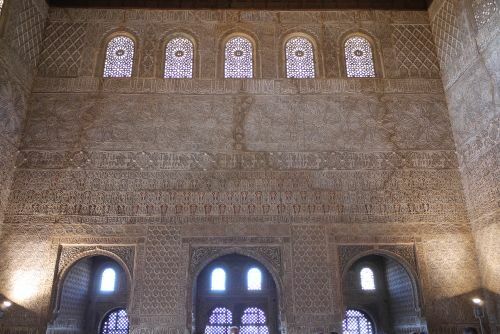 My favorite element of the Palace was the Spanish-Muslim Mudéjar plasterwork. 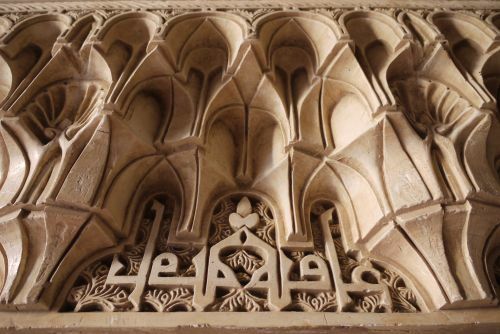 Nearly filling every doorway, window frame, ceiling, and encircling every room was a rich wealth of geometric inspired Islamic artwork carved into plaster reliefs. 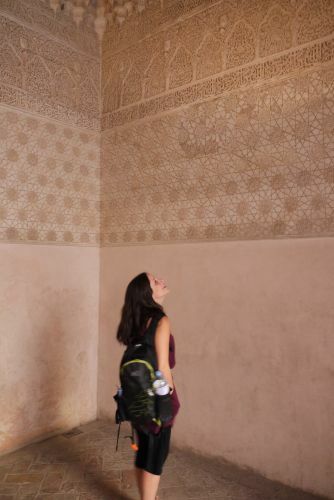 With countless rooms and passageways, the sheer volume of plasterwork is mind-boggling and gives you a true appreciation for the artisans who developed these architectural pieces. Last but not least on our tour was the Generalife gardens and palace. 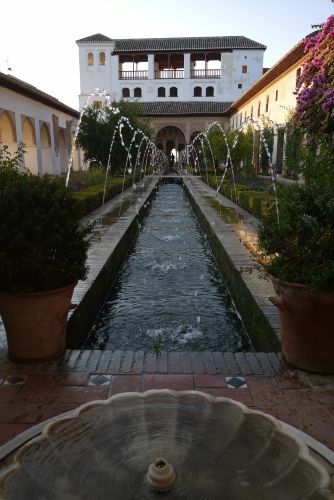 Originally used as a “getaway” for the royals when they needed a brief respite from the official duties, responsibilities and general hubbub that pervaded palace life, Generalife is an immense garden complex complete with countless gravity-powered fountains and groomed cedar tree awnings. There is no better or more peaceful way to end our tour then by taking in a bit of nature. Other than the Alhambra, the Cathedral of Granada constructed during the Spanish Renaissance definitely earned the silver medal in terms of things to see in Granada. Unfortunately for us it was closed on the day of our visit. But as Alison always reminds me, it is important to leave at least one thing “undone” or “unseen” so that we will always have a reason to come back and visit another day. Thanks mom. We are missing the fam very much these days. Thanks so much for the comment we always love to hear from you. We’ll be posting more soon! Love ya! Thanks for the comment. We would love to meet up with ya’ll! Keep us posted on your plans and feel free to email me at patwilsonIV@gmail.com when you get it settled. We are traveling a bit behind schedule right now so we might be in NZ around Feb 2012 instead of Jan 2012. Great to hear from you and Al and I are always excited to hear from fellow RTWers.